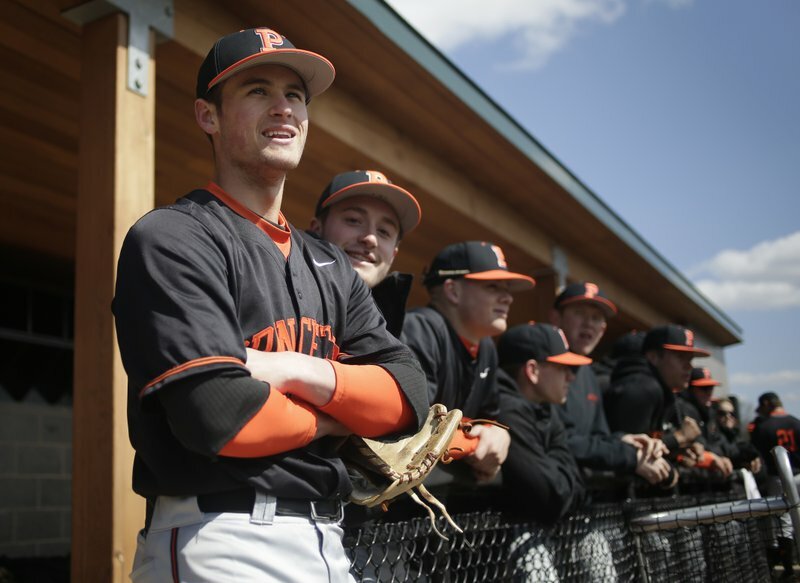 Jake Boone takes grounders on a chilly, wind-swept diamond, a month into his freshman season at Princeton University, hoping to follow Ray, Bob, Bret & Aaron and make his the first four-generation family of major leaguers. His family has been, well, a boon to baseball. Jake’s dad, Bret, was a three-time All-Star and four-time Gold Glove second baseman in a big league career from 1992-05. Uncle Aaron is the first-year manager of the Yankees, made one All-Star appearance while playing from 1997-2009 and hit the unceasingly replayed home run that won the 2003 AL pennant for New York. Grandpa Bob was a four-time All-Star catcher from 1972-90, then managed Kansas City from 1995-97 and Cincinnati from 2001-03. Jake’s great grandfather Ray was a two-time All-Star infielder from 1948-60. Bob maintains it is too soon to project whether Jake will get a chance to boost the already impressive family statistics: 6,569 games, 5,890 hits and 634 home runs. Princeton has no names on its jerseys but Jake’s background precedes his boyish face, darkened to a degree by the slight stubble that is de rigueur of a prospect. He has uncommon pedigree and preparation, and like pebbles on an infield has soaked in years of baseball from just being around. He played at Torrey Pines High School in San Diego, where former big league pitcher Kirk McCaskill is head baseball coach. He was selected by Washington on the 38th round of last June’s amateur draft; grandpa is a Nationals vice president and senior adviser to the general manager. Princeton’s coach is Scott Bradley, a big league catcher for nine seasons who has led the Tigers to seven Ivy League titles in 20 seasons so far and produced a half-dozen players who have appeared in big league games, including pitchers Chris Young and Ross Ohlendorf, and outfielder Will Venable. The House of Boone is to baseball what that Roosevelts, Kennedys and Bushes are to politics. The Boones became the first three-generation baseball family when Bret made his big league debut and have since been joined by the Bells, Colemans, Hairstons and Schofield/Werth lines — plus the Runges, if umpires are included. Jake was 6 when his dad played his final big league game in 2005. At 5-10, 170 pounds, Jake still needs to grow into his body and get stronger. He is hitting .182 (10 for 55) with three RBIs and seven errors, playing second at shortstop on a team that is 8-16 overall but 5-4 in the Ivies. He is adjusting to college ball on a team in the Northeast that starts against tough opponents in the south and then plays home games in cold he never experienced in California. Jake was a three-sport athlete through elementary school, dropped basketball in middle school and football in high school. He played club ball for the Rancho Santa Fe Titans from age 8 through his freshman year at Torrey Pines, then switched to the California Bears. He captained his high school team as a senior and hit .353. Princeton won him over at first sight when he visited in the summer of 2016. First semester classes included history of the Roman Empire, Spanish 101, microeconomics and a required freshman writing seminar. This semester’s workload is calculus — “my hardest class” — Spanish 102, macroeconomics and history of the late antiquity. He is leaning toward becoming an economics major but doesn’t have to declare for another year. Because of afternoon classes and labs, Bradley rarely is able to gather his entire roster for practices. And then Bradley got a chance to know Bret from 1990-92 when they were together in the Mariners organization. Bret had hoped to sign out of high school but wasn’t picked until the 28th round by Minnesota. He spent three years at Southern Cal, then was chosen by Seattle in the fifth round. Bret appreciates his son’s focus on education. Life at home was constant baseball talk, with mom and dad, older sister Savannah and twin brothers Isaiah and Judah, now 13. During dinner when visiting the grandparents, of course there was baseball on ESPN. “We were always watching Uncle Aaron’s game,” Jake says. He took an early morning train from Princeton on April 2 to New York for his uncle’s first home opener as Yankees manager but just after the train passed Secaucus, Aaron texted Jake that the game had been postponed. Jake got to Penn Station and took the next train back. He missed math, but made it back for Spanish. Baseball with the Boones will always be about family. Bret attended the March 2 opener at North Carolina-Wilmington. And he wonders what his emotion might be if Jake ever makes a major league debut.